Only a few more days to go before Christmas and the big question is, do you already have a gift for your special someone? Well, it's better to beat the holiday rush so you can already have your well-deserved rest by December. 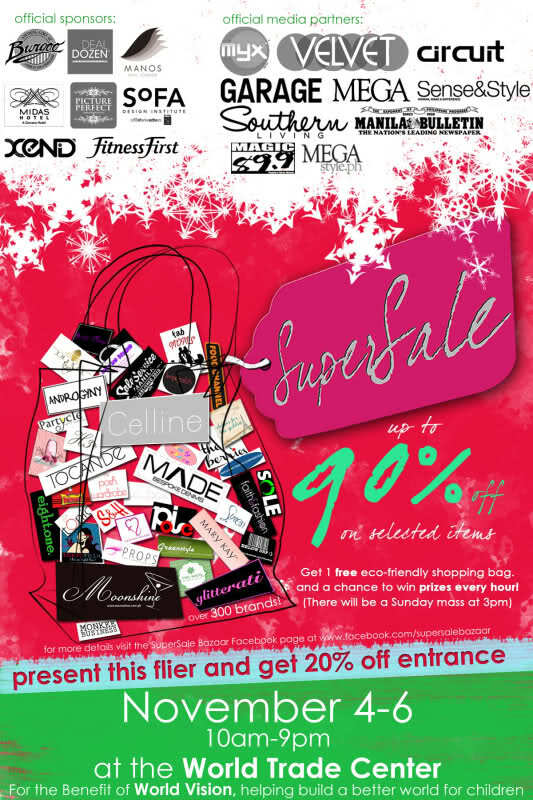 So what better way to do an early Christmas shopping and get as much as 90% off on selected but to go to the SUPER SALE BAZAAR this November 4-6, 10AM-9PM at the World Trade Center. Not only will you get to shop to over 300 brands and get discounts; but you can also get one (1) free eco bag and the chance to win from the raffle draw every thirty (30) minutes. Awesome, right?! On Sunday, there will be a mass at 3:00PM so you won't have to miss it when you go shopping; plus proceeds of the ticket sales will go to World Vision. Truly enlightening. In line with this bazaar, I will also be giving away three (3) passes for the SUPER SALE BAZAAR courtesy of Props Tools and Cosmetics! Read the instructions carefully okay? I will pick the best answer one in Facebook, one in Twitter and one in my blog. So, you've got three chances of winning a pass. Awesome, right? A great news to fashionista....thank you for sharing! It's 1:28am in the morning and here I am hoping to score free pass to the bazaar!! hrhr! I badly want to go because I want to score great items for my Coron trip scheduled this Nov14 and badly wants to do early Xmas shopping!!! Pick me, pick me!! Pick an old follower! haha!